ISKO Result 2016 has been declared for the ISKO (International Sports Knowledge Olympiad) for the exam that was conducted on September 15, 2016, and October 4, 2016. ISKO Result 2016 is declared by Science Olympiad Foundation (SOF) after the ISKO Answer keys 2016. Scroll down to check ISKO Result 2016. ISKO is the new addition to the olympiads organised by Science Olympiad. Foundation (SOF) the other 5 being ICSO, NCO, NSO, IEO and IMO. ISKO 2016 has been conducted for class 1 to 10 students. ISKO- International Sports Knowledge Olympiad. The candidates can check their ISKO Result by following the given link. 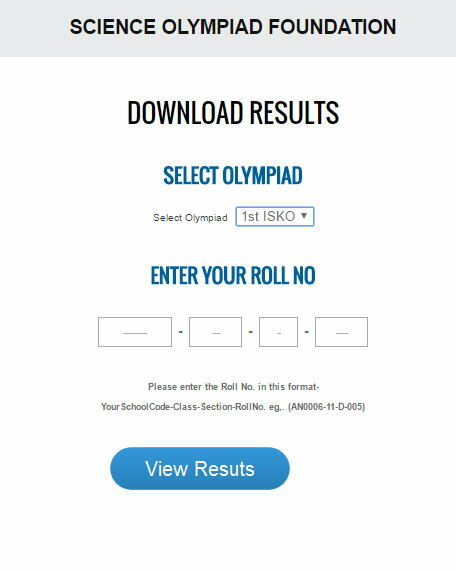 Enter Candidate's Roll Number and click on 'View results' to check ISKO Result. The ranking is given on the basis of marks obtained by the candidate in the ISKO exam. If there is a tie between two or more students who have been accorded the same score, the ranking will be determined on the basis of the marks awarded in the highly prioritized sections. If the score is similar in these sections also then both the students will be awarded the same rank. In the case of any confusion, the final decision will be of the Academic Council.